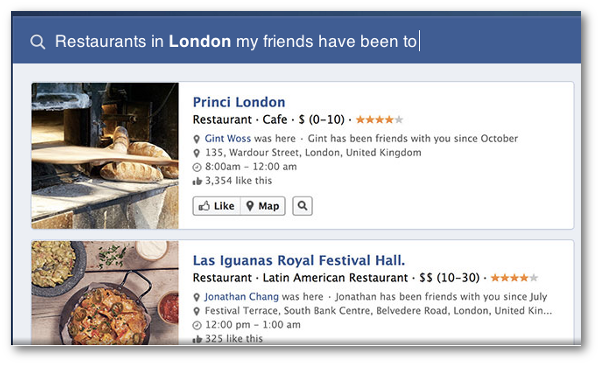 Do you want your brick and mortar business to benefit from Facebook Graph Search? It’s time to reconsider a feature you had likely long forgotten. That’s right, Check-in Deals. Not Offers. Instead, it’s the feature that Offers had supposedly replaced. Admittedly, I completely forgot about Check-in Deals when I was watching a webinar by Hubze. They spent quite a bit of time talking about how businesses looking to benefit from Graph Search should create Check-in Deals. My first thought: What year is this? You see, the Check-in Deal is an old feature (I’ll get to the details of the feature in a moment). Facebook Offers, I had thought, replaced the Check-in Deal close to a year ago. InsideFacebook.com published an article on February 29, 2012, essentially marking the demise of Check-in Deals. Facebook pages will soon have access to a new free story type that allows page owners to post offers that users can collect from News Feed or ad units. Unlike check-in deals, which required users to first visit a physical location, offers can be redeemed in-store or online. The social network plans to remove check-in deals in the coming weeks. Offers will be created directly from the page publisher and do not require approval from Facebook before going live. Check-in deals, on the other hand, were available through a hard-to-find dashboard and needed to be reviewed by Facebook. Starting today, no new check-in deals will be approved, but Facebook hasn’t provided exact timing for when these deals will be removed from the site completely. But Check-in Deals are alive and well (though I’ve been told they are not available in some countries). I created my own Check-in Deal late last week, but it has not yet been approved. I wrote this status update, and I was surprised to find out that many businesses are actually utilizing this. What is a Check-in Deal? 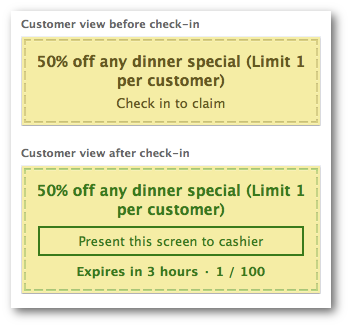 Individual: Offer a discount to an individual for simply checking in. Loyalty: Offer a discount or freebie for checking in a certain number of times. Friend: Offer a Deal to groups of friends who check-in together. Charity: A check-in results in a donation to the specified charity. How is This Related to Graph Search? Facebook Graph Search is currently in beta, but you can bet it will drastically change the way we search for and find information. Most importantly for the purpose of this blog post, it will change how we discover businesses. See that? Each listed restaurant displays which friends have checked in at that location. Everyone’s thinking about the “new SEO of Social Search.” Well, to show up high in Graph Search, you’ll need to do much of what you’ve been doing. You want to provide quality content that attracts engagement. But you also want to convert those customers who already visit your business to check-ins. So… how could one incentivize such a check-in, you ask? How about the Check-in Deal? If it even says “0” then you are set up properly. Otherwise, you will need to follow a process similar to what is outlined here. Now, go to Admin Panel > Edit Page > Update Info. 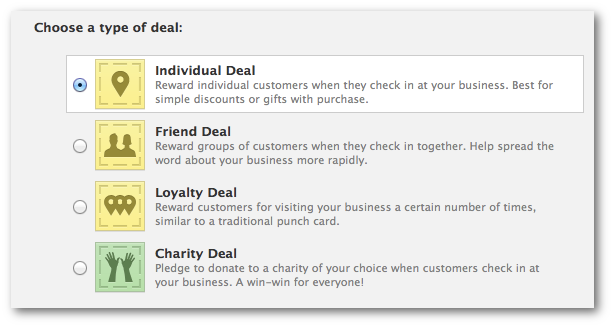 Now you’ll want to select the type of Check-in Deal that you want to create, as described earlier. Now define your Deal by indicating the details of your incentive and redemption. Okay, you’ve created your Check-in Deal. Now how are you going to let people know about it? You need customers to check-in because when they do so, their friends will see it (depending on privacy settings, of course). And as we’ve discussed, more check-ins will also help you show up high on Graph Search. 1. Make it a good deal. You’re offering 5% off if I spend a minute to fumble with my phone and give you free advertising? You don’t say? No thanks. Make it a good one! Understand that you are offering something in exchange for your customers promoting you to their friends. Additionally, you are giving them something with the hope that this will help others discover you in search. So don’t skimp when you consider the value, but also weigh the demand, costs and resources on hand. 2. Create a Status Update. Let your Fans know about it by publishing a status update. If you are local, you may want to target it appropriately. 3. Create signs. Most of your customers won’t also be your Facebook Fans. Create signs by the register or at tables letting them know that they can get this great deal simply by checking in. 4. Run Ads. 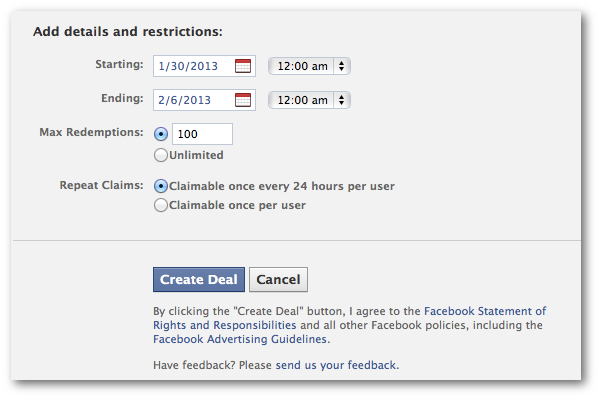 Unlike Facebook Offers, Check-in Deals don’t require advertising to publish to the News Feeds of Fans. You can create Check-in Deals at no cost whatsoever. But if you want to extend your reach, feel free to promote. A Promoted Post may be a good idea here. How are you incentivizing customers to check-in to your business? Let me know in the comments below!